I was home with both kids, set to enjoy a random mid-week day off while Veronica worked an extra day at her office. We had nothing scheduled as the kids only go to camp on Veronica’s regular work days, a fact that was not lost on Ryan. The night before, he must have asked 15 times if we had any place to go. He likes to have his days planned in advance. We give him space to do the things he enjoys doing at home on these unstructured days, it we also try to balance it out with some structured activity, whether it’s running errands or going to the town pool. Ryan tends to isolate himself when he spends entire days at home and his behavior suffers as a result. Even he recognizes this trend. Veronica reminded me of the need to get the kids out of the house before she left for work. She knows I’m not as ambitious at planning outings, and she did not want me to let the day slip by without any activity. I told Ryan we would be doing something, I just didn’t know what. Everyone made suggestions. We settled on mini golf, but just as we were thinking about getting ready, the skies turned dark and a thunderstorm rolled in. Time for Plan B. To be honest, I wasn’t that enthusiastic about Plan A. Ryan has a checkered history with mini golf. His first outing is one I vividly remember — for all the wrong reasons. We were at the Great Wolf Lodge for a two-day stay during spring break a few years ago. We have had several successful experiences at the Great Wolf Lodge and it has been one of our “safe” spots. After talking Ryan into trying some of the bigger slides, it was great to see him run off with Riley for hours, riding on their own. It’s those moments that make the exorbitant prices worth it. 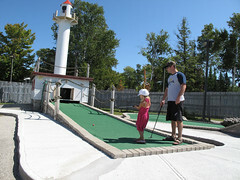 For whatever reason, we decided to augment this particular visit with a round of mini golf on the on-site course. After paying the fee — an amount that might have covered nine holes at Pebble Beach — the outing quickly turned into a disaster. Ryan wouldn’t wait for other groups to finish their holes ahead of us. He wouldn’t wait for his ball to stop before hitting it again. He refused to let me help him properly hold the club. He complained, loudly, about how long it was taking. The round was ruined for Riley, who was just trying to enjoy herself. After nearly pulling the rip cord and abandoning halfway through, we finally coaxed Ryan to the 18th hole, where he promptly sank the impossible “free game” shot. I can assure you, we did not collect on that coupon. Other outings have been somewhat better, but he’s still too impatient, holds the putter like a hockey stick (and hits the ball like a slap shot) and generally loses interest after a few holes. So when the weather intervened, I suggested a movie instead. I could not talk him into Ice Age 4, and taking him to a movie he didn’t want to see would ruin it for Riley. It was Ryan that finally came up with the plan. He suggested a different mini golf outing. This course was indoors, full of black lights, loud music and Halloween decor. Ryan had played it a couple of years ago on an outing with his social skills group, and apparently had fond memories. We arrived just behind a large group of day campers and would told it would be 15-20 minutes before we could get on. Normally, this would spell disaster and have me scrambling for the exit. But the course just so conveniently had an arcade in the waiting area with two air hockey tables. Ryan loves air hockey. We have a small table at home but he never passes up the chance to play at an arcade. The time passed quickly as he beat me in three straight games while Riley played Skee Ball and Whac-A-Mole. Once on the course, Ryan surprised me with his engagement. He was still impatient and wanted to hit his ball before it stopped rolling, but he didn’t complain about waiting for the group ahead of us to finish and was willing to listen to pointers about holding the putter properly and not hitting the ball too hard. He was also better than Riley, a sign of his growing coördination — something gained from the endless hours of backyard street hockey. The lights and the music and the fake monsters didn’t bother him at all. I was feeling good about things as we prepared to leave. We had gotten out of the house, and done something at Ryan’s suggestion that had gone better than previous attempts at the same activity. Both kids had enjoyed themselves, and we had killed a good part of the day, with lunch still to come. As we were walking back out through the arcade, another memory struck that put things into perspective. There was another group of day campers entering. I recognized the name of the special needs camp Ryan had attended several years earlier on one of the kids’ shirts. I immediately scanned the group of watching children for signs, and they didn’t take long to find: hand-flapping, unexpected noises, looks of general detachment. I asked Ryan if he noticed the name of the camp and he recalled it as the camp he hated. His last year there, he had an ongoing conflict with another boy in his group, and he still brings up the name any time we discuss bullying. That experience has colored his entire memory of the camp. We decided to go in a different direction the following summer because Ryan did not want to go back, and because the wonderful camp director had told us he was a borderline candidate. Subsequent camps have been a mixed bag. Ryan struggles to fit in, but has had some incredible counselors and shadows. His current camp is about as good as it gets. The counselors are excellent, and Ryan does willingly. He he still has his social struggles, but his overall experience is positive. I was thinking about how far we have come from those summers at the special needs camp when something happening right in front of me snapped me back to the present. A girl of perhaps 11 started screaming and crying in the desperate, pained way that was all too familiar. I watched a counselor do exactly what I have done many times. He took her hand and quickly guided her away from the group to a quiet area outside the entrance, away from the prying stares of other customers, the lights and the music. He sat her in a chair and got down to her level so he could look her in the eyes and try to calm her. He didn’t tell her to stop crying. There was nothing but kindness in his voice as he tried to figure out what was bothering her. In the few moments I overheard as we walked past, he figured out that she wanted to play but the monsters and the darkness scared her. He told her it would be OK and that she could still play. When we got to the car I decided I had to say something. I asked Ryan if he knew why he had gone to that camp. I told him it was because of his challenges related to autism. I also told him he doesn’t need to go to that camp anymore. I wanted to make that point, to have him understand that just because his brain has different wiring doesn’t meant he will always have the same challenges or that he can’t make incredible progress. This was an interaction I would not have had in past years. Indeed, when Ryan had attended that camp we avoided explaining to the kids why they were at separate camps for the summer. That too, is a sign of progress. It might be time to have a talk with Ryan about helping others that are struggling with issues. He is so good with others for the most part. (Sisters don’t always count.) Think back to how he was helping everyone that fell down ice skating. Being helpful to others is very empowering. You just have to make sure that he realizes the help is not always wanted and how to let it go. Have him “play it forward” or keep a track of the good that he does to others. Use those “teachable moments” for little enlightenments into feelings and all those other greatnesses we could all do to make a better world…even if it is just our little piece of the world. I believe he can make a difference. Funny you mention this. We spent much of the ride home from mini-golf discussing a boy in Ryan’s camp group that gets picked on, and how important it was for both kids to intervene and stick up for him.